One of the initial reasons for me to buy a CNG car was the cost savings. Here is a little calculator that will estimate your cost savings in a typical year in driving a CNG car vs. a regular gas car. The $0.99 cost per gallon of the CNG is if you are using a Phill station. The cost of an oil change is in there because a CNG car needs oil changes about half the time of a normal car, saving you money. Fill in the values with your numbers and click on Calculate Savings to see your Annual Savings. You could save even more than this calculator shows since the Honda Civic, the most popular natural gas vehcicle on the market is most likley more fuel efficient than what you are driving now. You can search craigslist for CNG related items using this google search button. 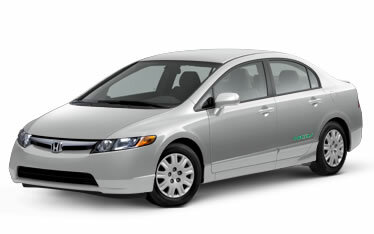 Type in "CNG" or "CNG Cars" to search Craigslist. Using the new EPA estimates for fuel efficiency, it gets 24 mpg in the city and 36 mpg on the highway. (Using the old estimates it was 30/38.) There is a $4,000 tax rebate available for purchasers of this car. Note that is a tax rebate, not a deduction, so you get the entire $4,000! In California, the Honda Civic GX also qualifies for the Clean Air carpool stickers, allowing you to drive solo in the carpool lane. This is a great benefit for those commuting in congested areas. This is not a comprehensive list of news sources about CNG cars, but just the ones that I thought were particularly noteworthy. Jay Leno has a web site called Jay Leno's Garage, and they did a video segment on the Honda Civic GX. It's good to see high profile people extolling the virtues of CNG!